Foxes can be a major problem for homsteaders. We used to allow our chickens completely free range, but once we started losing one or 2 a day we had to put them in a large run instead. Last year we even had a fox family move into our cow pasture- where the ducks love to hang out! Our ducks still free range most of the day- until their numbers started dropping about one a week. The foxes were getting braver. Even standing on our front walk while I yelled from the deck. We had to start physically chasing them off. That would stop them for a day or two, but we still needed to find a way to get rid of foxes for good. Because they are so intelligent, you are more likely to catch a raccoon or your barn cat in a live trap. 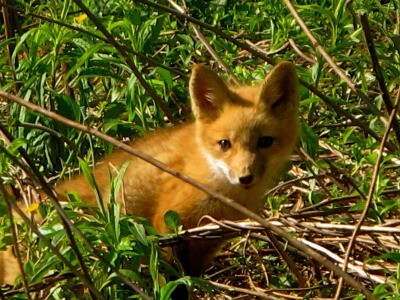 While foxes do hunt at night most of the time, they will hunt during the day time. This is especially true during winter and when a mother has kits to feed. The best way to keep your birds safe while you try to get rid of foxes is to keep them in a secure coop and run. And I don’t mean marking your territory around the chicken coop or run. That won’t deter these foxes- though it’s probably a good idea to still do that. What you have do do is search out the actual den and urinate directly into it. This can be quite fun for any young boys you might have at your place. Send them on a fox hunt and let them mark any areas that look like they might be fox dens. The foxes on our property like to move into old groundhog holes, so we mark all those as well. Before we started using this tip, we would see foxes all through the day. We would see them on our front walkway and they wouldn’t run even when we came onto the front deck. We had to physically chase them off. We haven’t found all the dens in our area- there are a lot! But we have drastically reduced the amount of foxes we see during the daytime when our birds are out roaming. Foxes are stubborn, especially in the winter when food is more scarce, so you have to be diligent in searching out any new dens. But foxes are nomadic and if you consistently deter them they will move on to an easier place to hunt. Great tip! Nobody wants to hang around where others are peeing on their bed. Now I wanna be a farmer for sure!! i have 3 of them in my back yard under an old barn and have an old shed..i,m not even a farmer either..but my lawn mowers have been out for repair and i,ve been sick…what do i do?….they kind of scare me because i have grand kids,and i,m afraid to let them out in my yard to play. I turn on an outside radio with a talk show and so far it has worked keeping them away from my house. I have a den of them close by. They don’t like human voices. We now have 4 Anatolian Shepherd Dogs. It took a while to train these pups to not play with the chickens. At 18 months old now, we think we have achieved that. They keep an eye over our goats and our chickens. We have less predation on our chickens now. I have not seen anything other than a King Snake, and a Boa Constrictor get a chicken, but I think other predators were getting some of our chickens. How I think they are doing their job is that we are not loosing chickens to the degree we were before. Our chickens free range from 6 AM to 5 PM 7 days a week, over 22 acres. Most come home each night with food enticement to reside in the coup. Think this will deter bobcats as well? Right now I’ve got a radio at full blast. Haven’t lost a chicken since hooking up this this but getting tired of the noise. how do I know if there will be pups in the den or not, I hate to cover in the den and there be pups. I was loosing chickens until I started letting the dog out to do patrol after dark. Haven’t lost another since. He’s large and sees the chickens as family, so do the cats.